The number one draft pick from 2013 shows composure to slot one for the Giants. The final siren sounds with a comfortable win for the Swans in the end. 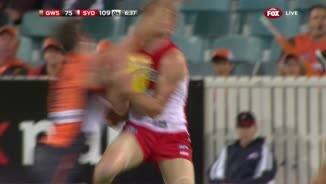 The Giants came to within two goals in the third quarter but the Swans took control from there to win by 40 points. Greene has 30 disposals for the Giants. Mitchell has gathered 34 for the Swans. The Giants have given a reasonable account of themselves with obvious improvements coming from the many third year players they have. 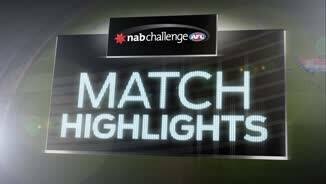 The clock winds down on another NAB Challenge match. Just under three minutes remains. GOAL SWANSRohan takes a courageous mark in between two Giants defenders and takes a few seconds to get the breath back. He gets back on his feet and kicks the goal. The sting appears to have gone out of the game with both sides looking tired. BEHIND GIANTSAddison marks and will kick from 45 metres out. He lines it up and it fades from left to right once again. The Giants will want to finish off the game well here. It would be a terrific confidence boost. BEHIND GIANTSPalmer uses his body to edge out his opponent and mark. His shot fades from left to right for a behind. GOAL GIANTSThe long kick comes out from the middle and it bounces nicely for Ward who gathers the yellow football and kicks his second goal. The Giants need the next goal so this game doesn't completely blow out. GOAL SWANSHarry Cunningham is staking his claims for a Round one start with this performance. 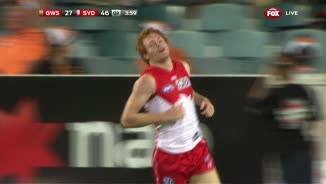 Another wonderful kick at goal from just inside 50 takes the Swans' lead out to 7 goals. The Swans have been in control from the outset in this final quarter. Addison has been good for the Giants and has made an impact on the scoreboard tonight with two goals. The Swans have kicked both of their goals in the final quarter from the goal square. GOAL SWANSMitchell receives the free kick then the 50 metre penalty for dissent. He walks in and kicks the goal. GOAL SWANSCunningham kicked a super goal earlier this evening and this time it's another spectrum with Cunningham gathering in the goal square and dobbing it through. The Swans lead by 24 points at three quarter time. GOAL SWANSO'Keefe handballs inside to Kieran Jack who lets rip off two steps and kicks a ripper! That's how you kick it! GOAL SWANSAn awkward bounce deep in attack sees Nankervis advantaged. He spins around, sells some candy and kicks it along the ground for a goal. This game is still alive late in the third quarter. The Giants are a chance. GOAL GIANTSThe Giants run in numbers and three players can raffle it. The ball sits in Whitfield's lap and he trots in to kick the goal under little pressure at all. GOAL GIANTSCameron crashes the pack. The rebound comes to Patton who is mobile for his size. He handballs it off to Addison who kicks a wonderful goal from 40 metres out. GOAL GIANTSBig Giles marks it just out of the goal square. He lines it up on the angle and it's no trouble for Jonathan Giles. The Giants pull one back. GOAL SWANSSome beautiful work out of the centre by the Swans. Out comes Reid and he takes it 15 metres clear of his opponent. He kicks his third and the Swans extend the gap. GOAL SWANSSome beautiful coast to coast stuff by the Swans. Mitchell latches onto it and seals the deal. The Swans have steadied the ship. The Swans have done a good job of slowing down the tempo and they have the game back to their terms. Patton is on the field for the Swans but is yet to make an impact. Regardless, it's still great to see him out there. GOAL SWANSRhyce Shaw drifts into the forward 50. He takes the footy and snaps it across his body for a goal. He doesn't get the opportunity often but when he does he's good! BEHIND GIANTSConiglio snaps it from the pocket but it's just the minor score. BEHIND GIANTSMumford takes a mark just inside 50. He lines it up, it starts left and it stays left. The Giants have started the third quarter in impressive fashion. GOAL GIANTSJeremy Cameron doesn't miss many and this one is no exception. New year, same Cameron! This player is a star in the making! 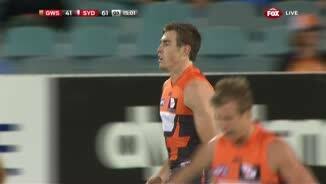 Jeremy Cameron yet to touch the footy. That's about to change. BEHIND GIANTSGiles juggles the mark over the goal line and it's a behind to the Giants. GOAL GIANTSThe Giants get the all important first goal of the third quarter. Addison uses his strength to take the mark. He runs in from 30 metres out and finishes it off. The last three scores have all been behinds that have hit the post. BEHIND SWANSRohan crumbs the pack and kicks a bouncing grubber ball that goes straight into the post. The Swans lead by 26 points at halftime. BEHIND GIANTSWard is paid the free kick before the siren. He lines it up and it hits the post. BEHIND SWANSMitchell hurries the shot at goal but it bounces into the post. GOAL GIANTSGreene runs down the pocket and kicks to the front of the square where Lamb marks. He doesn't waste any time at all and kicks the goal. BEHIND SWANSMalceski has the set shot 40 metres out. He doesn't miss too many, but on this occasion he does. Malceski takes a breather and dons the red vest for the rest of the second quarter. His place is taken by Jordan Lockyer. The Swans lead by 31 points after kicking the last couple of goals. GOAL SWANSLloyd handballs to McVeigh who runs out of the middle and kicks to the lead of Reid. Poetry in motion! Reid goes back and kicks the goal. GOAL SWANSDerickz with a mammoth kick from the centre. B. Jack flies in the air with no regard for his health. He is unable to mark but through comes Rohan. He sells some candy and kicks it. Patton is warming up and is ready to rock and roll after his serious injury last year. BEHIND SWANSHannebery tries to snag one from the pocket. He isn't too far away but it's only a behind. Take off the Swans' two Super goals and the scores would be level. GOAL GIANTSShiel marks and plays on. He gets himself in trouble and then gets himself out of trouble with an exquisite pass to Whitfield who marks low. Whitfield squeezes it through. The Swans with a high pressure game. They double the tackle count of their opponents. GOAL GIANTSGWS have broken through and halted the Swans' run. Smith is paid the free kick in the stoppage. From 30 metres out he kicks right through it and makes no mistake. Greene with a chance to pull one back for the Giants, but his kick fails to register a score. All of a sudden the Swans lead by 30 points. GOAL SWANSIt's raining goals for the Swans and it could be raining SUPER GOALS! Cunningham runs past to receive the handball. He calculates as he bangs it home from outside 50! GOAL SWANSReid would be keen to perform in the pre-season with Tippett and Franklin occupying other forward positions. He takes a strong mark and kicks his first. The Swans are on the attack again as they run out of the middle. GOAL SWANSThe margin goes out to 15 points as Nick Malceski kicks a SUPER GOAL! BEHIND SWANSKieran Jack with an opportunistic soccer off the ground but it's across the face of goal. BEHIND GIANTSThe margin drops to within a kick with a rushed behind to the Giants. GOAL GIANTSCameron palms the ball down in the marking contest to Coniglio who centres beautifully to Ward who rushes out and takes the mark. Ward slams it through. BEHIND SWANSParker with the first score of the second quarter and it's a snap that goes through for a behind. The siren sounds for quarter time with the Swans leading by 11 points. BEHIND GIANTSGiants everywhere in the goal square but it's off hands and through for a behind. BEHIND GIANTSGreene marks 35 metres out but the kick at goal is a shocker and lucky to sneak in for a behind. GOAL SWANSMumford begins his charge at the ball but Derickz comes out of nowhere to take a magnificent mark. He takes care of business by kicking the goal. BEHIND SWANSBrandon Jack marks 45 metres out. He kicks well away from the man on the mark and probably costs himself the goal with the ball off hands and through for a behind. Another player playing at his third club for the first time tonight is Shane Mumford who crosses from the Swans after also starting as a Cat. Jeremy Laidler making his first appearance as a Swan after crossing from Carlton. This will be his third club after starting at Geelong. GOAL GIANTSIt's taken them 11 entries inside 50 but the Giants finally have their first score. Whitfield is at the back of the pack. He reads it best and sticks his boot at it to kick the goal. 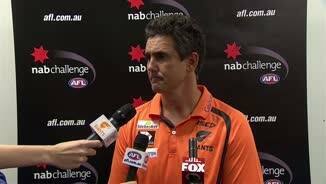 Simon Katich is the runner for the Giants tonight and the rest of the season. Heath Shaw playing his first game for the Giants after a long career with the Magpies. Sydney must provide some ideal beard growing conditions with plenty of facial hair out there tonight. The Swans are running it out well out of defence and with confidence. GOAL SWANSSam Reid hits the pack hard. The spillage sees Rohan spring into action and he gets it along to Brandon Jack who kicks it deliberately along the ground and see it bounce through. The Giants have been inside 50 6 times and are yet to produce a score. GOAL SWANSSydney break through half back. It goes to Towers who is deceptively quick. He takes a couple of bounces, runs inside 50 and kicks the goal. More than seven minutes in and the goal umpires are yet to do any work. Big Jon Patton is back for the Giants and he starts the match as one of the Giants' two subs. Coniglio with a long range shot at goal, but he sprays it. A bit of rust from the off season is being shaken off here tonight ladies and gentlemen. The Swans are without Franklin and Tippett tonight, two of their recent high profile and highly paid recruits. Cunningham has a set shot at goal from 45 metres out but to say it's a shank is an understatement. Reid takes an early mark in defence in a good sign for the Swans. We are off and underway in Canberra. Welcome to Canberra for tonight's all New South Wales clash between Greater Western Sydney and Sydney. The Swans are expected to win but the Giants are fielding a strong team. RHYCE Shaw's remarkable return for a knee reconstruction in less than six months has cleared another significant hurdle with the veteran Sydney Swan putting in a tidy NAB Challenge performance in Canberra on Thursday night. Shaw, 32, underwent LARS [ligament augmentation and reconstruction system] surgery in August last year after injuring his right knee against Geelong in round 22. 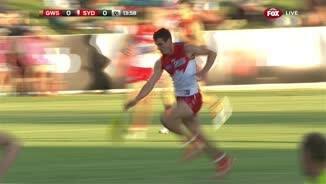 Now, less than half a year later, the 2012 premiership player made a strong comeback with 20 disposals and a third-quarter goal in the Swans' 40-point win over Greater Western Sydney at StarTrack Oval. 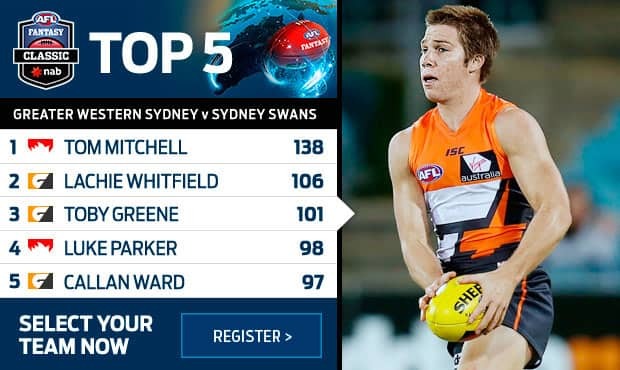 Shaw's return was a highlight for the Swans in their 2.15.7 (115) to 0.11.8 (75) victory, which saw impressive performances from youngsters Tom Mitchell and Gary Rohan, and Giants Lachie Whitfield and Stephen Coniglio. Whitfield, the No.1 draft selection from 2012, shone with some precise kicking and vision to end with 25 possession and three goals, plus three scoring assists. 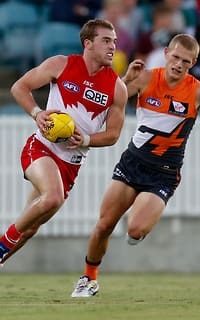 Sam Reid played forward and kicked three goals, and moved freely in an encouraging sign for the Swans given his recent track record with quad complaints. The Giants weren't disgraced in the game and displayed better ball movement between the arcs than they did in 2013. Jonathon Patton came on after half-time in his first game since he tore his anterior cruciate ligament in round three last year at the same venue. The burly forward started as the substitute with the Giants structuring their forward line around Jeremy Cameron, Jonathan Giles and Adam Tomlinson in the first half. He lined up against Heath Grundy and also spent time against Ted Richards. As expected, he started slowly but assisted in a goal to Dylan Addison to end with three touches. A number of other Giants put in strong performances, namely Coniglio, who had 29 disposals (17 at half-time) and set co-captain Callan Ward up for the team's second goal. Ward played well, showing strong evasive skills in the second quarter when he danced along the boundary before finding Toby Greene in the forward 50. Greene had plenty of the ball (30 disposals) but was let down by shonky kicking in front of goal with two untidy shanks in the first half. Lance Franklin, Mike Pyke, Lewis Roberts-Thomson, Lewis Jetta, Adam Goodes and Kurt Tippett were missing for the Swans while the Giants left out their three recent top 20 draftees – Tom Boyd, Josh Kelly and Cam McCarthy. Franklin, Pyke and Roberts-Thomson are expected to play against West Coast next Thursday in Blacktown, and Boyd and Kelly could face St Kilda in Wagga on March 1. Greater Western Sydney: They're getting better. They kept coming up, even when the Swans were able to kick super goals and push the margin away, and got within two goals in the third quarter. There's no doubt their mature-aged recruits will each bring something to their game, despite some being better than others on debut, and Patton will get better with each run. The end margin didn't reflect the contest with the Swans flattered by a streak of late goals but even then, the Giants were able to offer some resistance. 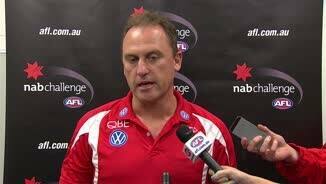 Sydney Swans: The Swans, famous for being largely disinterested with the pre-season football concept, didn't really have to get out of first gear to find answers when challenged. Every time the Giants inched closer, they put space on them with a combination of young players and senior heads steadying the ship. Jarrad McVeigh had a few vintage moments in the second quarter when he burst out of the centre and landed one in particular on Sam Reid's chest, while Nick Malceski gave them excellent drive into attack. They did it pretty easy and look set to be a contender again this year when their raft of absentees join in over the coming weeks. Greater Western Sydney: It was all about the mature heads for the Giants with their five recycled acquisitions playing. The left foot of Josh Hunt will prove to be a weapon for the Giants this season. The two-time Geelong premiership defender had a couple of big kicks from half-back, hit targets and gave his new team some power. Former Bulldog Dylan Addison started strongly and looked zippy in the forward line, which he complemented with a nice contested mark at the start of the third and a pair of goals for the game. Jed Lamb found himself on the end of a nice piece of coast-to-coast play to resulted in a goal and he ended with 12 disposals. Shane Mumford dominated in the hit-outs with 30 while Heath Shaw had a quiet first half with seven touches and two rebounds but looked to lead well in the backline on his way to 13 for the game. Sydney Swans: After being starved of opportunities at Richmond, it's clear Tom Derickx isn't going to waste a second at the Swans. The ruckman took a strong mark and kicked a goal in the first quarter after starting against Mumford. He also tackled strongly and stood strong in the centre hit-outs. Jeremy Laidler looked cool in defence and spent time on Adam Tomlinson while Toby Nankervis was pitted against Phil Davis at full-forward and managed a goal in the third.